The Grammys Awards ceremony hasn’t even started yet, but Lady Gaga already has two wins under her belt for A Star Is Born‘s hit original song, “Shallow” and the titular track from her album Joanne. 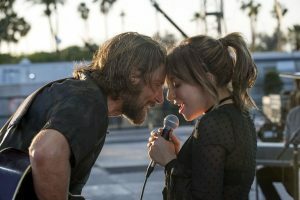 The power ballad, which Gaga sings with costar Bradley Cooper in the musical film, has won the award for Best Song Written For Visual Media, the Recording Academy announced this afternoon. Sharing the win with Mother Monster are producers and songwriters Mark Ronson, Anthony Rossomando, and Andrew Wyatt. Gaga also earned an award for Best Pop Solo Performance with “Joanne (Where Do You Think You’re Goin’? ),” the Recording Academy also announced on Twitter. “Shallow” is up for more awards at tonight’s ceremony: Song of the Year, Record of the Year, and Best Pop Duo/Group Performance. Gaga is also expected to perform the song at the ceremony, but she’ll be going solo, as Bradley Cooper is in the U.K. for the BAFTA Awards, which also took place today. However, fans will be able to see the duo reunite on the stage at the Oscars later this month. Tonight’s awards mark Gaga’s seventh and eighth Grammy wins, following previous victories for works like “Bad Romance,” “Poker Face,” The Fame, The Fame Monster, and Cheek to Cheek. In addition to the Grammy wins, A Star Is Born also won a BAFTA today for Best Original Music. Gaga responded to that win with a heartfelt tweet, too.